So yesterday was a glorious day! The weather was lovely, the river water was freezing, but they balanced out nicely. We were on the river for 3 and a half hours and got to discover a whole new section of rapids, which were AWESOME! There have also been some upgrades. 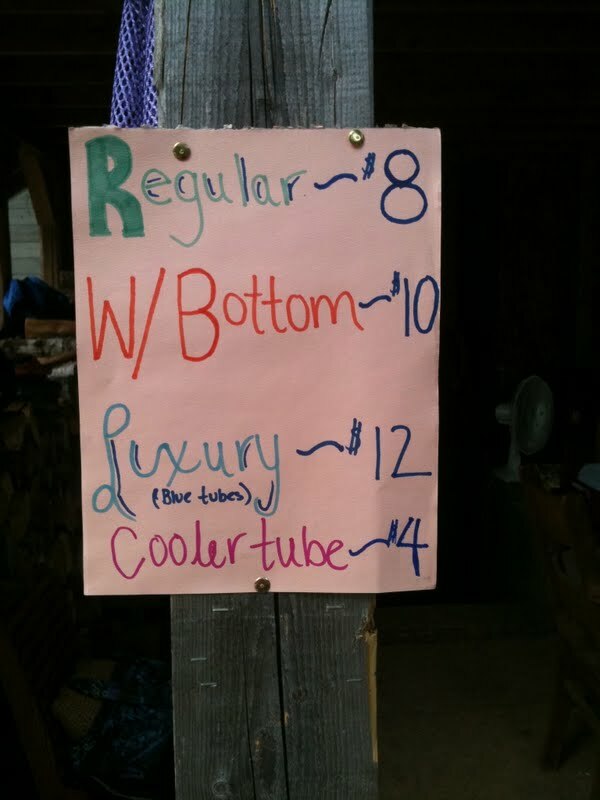 Please note the THREE levels of tubes available for rental. Last year, there were only two, but now...NOW, there's a LUXURY option! Speaking of 'discovering' there was another group with us, two younger couples. Usually the river's packed on a weekend, but the only drop-off time we could get was at 11, so it was just us and them. To call them annoying would be an understatement. Eventually, they got far enough ahead so we couldn't hear them anymore. When we did catch up, it was because they pulled over on the side of the riverbank. We saw the four of them, searching through the tall grass and when we got close enough, overheard them saying that they'd found beer hidden in the bushes! It was like a drunk Easter Egg hunt, the four jackasses using sticks to search for more undercover brews. Who knows how they got there, or how the two couples even found them in the first place, but it kept us giggling for the rest of the afternoon. The only really bad part of the day came at the end. There's a dock at the bottom of the giant staircase where you get out, which is where I saw the BIGGEST SPIDER OF MY LIFE! BIGGER than the one that tried to attack me in my backyard last summer. BIGGER than the one that Marc had to kill with a shovel. In fact, my hetero-life-partner said that she'd NEVER seen a BIGGER spider in ALL OF NEW BRUNSWICK! It belonged in a museum, under a glass box. Not all up in my grill. 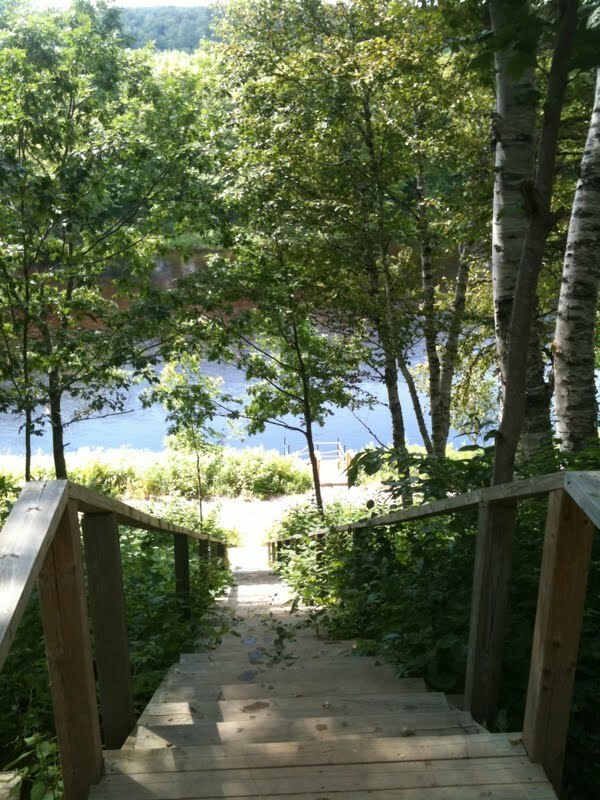 The super-inconvenient part was that I discovered the spider, which was directly beside the ladder, while my two buddies were still in the water. After screaming for a while and tossing a few rocks, it went under a larger rock, so my girls could get up quickly. Seriously. It was bigger than The Pickle and wanted to eat us. That sounds like so much fun! (The river part, not the spider part). 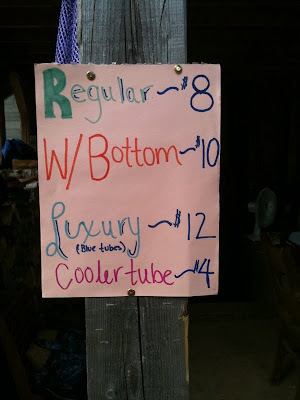 I would need the luxury tube with the drink cooler tube too. I could see how that could be quite a relaxing day! I think you'd be all about the luxury tube, Nikki! It keeps your whole body out of the water and there's a backrest and cupholder! Very sophisticated.